Background screening has been in and out of the spotlight since becoming commonplace decades ago, but nothing compares to today! Whether you’re new to pre-employment background screening and tenant screening or if you’re a seasoned veteran, it is important have an idea of what is in store for the industry. There’s a saying out there: If don’t you think you are vulnerable to a data security breach, you haven’t found your vulnerability yet and you’ve probably already been hacked. Wow. Hackers are sophisticated and brazen. Incredibly, the U.S. government database at the Office of Personnel Management, OPM, was hacked in 2015 leading to a massive overhaul through much of 2016. Almost 22 million records were compromised, including security clearances. Thoughtful diligence, stellar IT support and an unwavering commitment to security will be a continued demand to protect data and keep business moving. Use strong passphrases (rather than passwords) and avoid sharing logins. Give extra attention to anywhere background reports are stored – digital and hard copy. It’s no surprise 2016 is focused on immigration. Completely separate from the politics, United States Immigration and Customs Enforcement (ICE) has increased audits every single year from quantity to generated revenue – promising to do the same in 2017. Furthermore, the cost per violation increased quite significantly on August 1, 2016. There’s no need to predict this one: Audits will increase and we will see record-setting fines for Form I-9 and E-Verify violations. 1. E-Verify mandates will increase. E-Verify is only mandated in a handful of jurisdictions (region or state), required for certain types of industries or for certain types of employers. It is highly likely that we will see an increase to E-Verify mandates in both private and public sectors, especially considering the heightened attention during this year’s presidential campaigns. Also recall that in 2014, TX Gov. Rick Perry signed into law, effective immediately, a requirement that anyone doing business directly with the Governor’s office must run employees through E-Verify. Employers should at a minimum familiarize themselves with E-Verify and have a basic understanding of how they may implement the service should it become mandatory. Here’s a blog that will help you better understand the difference between background screening and E-Verify. 2. Digital Form I-9 integrations that are not compliant with USCIS will be investigated… and fined. An increasing number of employers have opted to digitally manage their Forms I-9 using services like Choice Screening Form I-9 ComplyTM and E-Verify integration. The time and money saved is immediately realized as is the peace of mind from error checking algorithms. Most importantly, we’re compliant with USCIS requirements for both digital Form I-9 and E-Verify integration. Not all applications can boast the same. It won’t surprise us one bit to see substantial penalties for Form I-9 and/or E-Verify violations that include technology non-compliance. Diligent employers will consider switching to fully USCIS compliant applications, like Choice Screening. Use this Form I-9 Self-Audit Guide to evaluate and properly correct your Forms. Familiarize yourself with E-Verify and consider how/if you should implement. Confirm your digital Form I-9 and E-Verify integration application is fully compliant according to USCIS requirements. Ban-the-Box has caught on. Nearly half the states and over 100 cities and counties have laws specific to the use of criminal records for pre-employment background screening purposes. In addition to criminal records, many acts restrict the use of credit reports for employment and pre-employment. Employers can expect these trends to reach their area through state or local legislation. An increasing number of employers will voluntarily adopt Fair-Chance-like policies (probably very publically for big employers). Clear understanding of these laws is the key as many place various restrictions and are often unclear or duplicative to existing practices. Also, the “newness” results in unestablished case law, which will have repercussions of its own. Seek legal advice when appropriate, especially while adjusting to these laws. Prepare for changes to: (1) when you ask about criminal history, (2) what criminal history you can use, (3) your use of credit reports, (4) how criminal and credit history are used in your hiring decision, and (5) your adverse action process. In general, there are three tiers of commonly used criminal record searches: National, Statewide and County. Each search carries with it pros and cons. For example, national and statewide searches cast a wide enough net to possibly uncover cases outside an address-based county criminal search. In scale, an employer gets much more for their dollar with broad searches. However, nationwide and many statewide databases are intermittently submitted to by the local county courts. Some counties, maybe ones where your applicant lived and committed a crime, may not be included at all. Conversely, county court searches are the direct source and therefore most reliable, accurate and up to date. Unfortunately, they only access one specific jurisdiction, limiting their scope. Then there’s the state and FBI fingerprint databases: increasing in popularity due to crime shows and rideshare company feuds, such as Uber, Lyft and Austin TX. Unlike the incredible access depicted on TV, the FBI database is often lacking in case details and does not contain all criminal records, arrests, convictions, sentence violations, etc., throughout the US. It is intended for FBI investigations and coordination among law enforcement, not pre-employment background screening. It is also limited to specific trades. As such, it is a tool for pre-employment background screening, not a fail safe. Statewide fingerprint databases are similar in that they do not contain all criminal records that may be important to you as an employer. Further, complete reliance on fingerprints, such as by Boards of Education, substantially impacts the quality of a criminal history search. Think about it – does every single criminal case contain fingerprints? No. Misconceptions among the databases described above and what they actually achieve will continue to result in confusion regarding legislation, workplace policy and political agendas. There is not, and unlikely to be, a one-size-fits-all perfect criminal record search. While the various available criminal record searches gain attention, the scope, value, benefit and limitation of each will eventually be discussed… and with hope clarified. The best way to select the right services, especially among criminal record searches, is to clearly establish your budget and your needs realizing that if budget v. need is not in sync, one may need be sacrificed to achieve the other… Choice Screening can help you weigh your priorities. On a similar note, there is continued confusion over who actually does what in the background screening industry. One such “political confusion” includes the letter from Senator McCaskill to 21 consumer reporting agencies – well-intended, but several questions perpetuate misunderstandings surrounding pre-employment background screening companies. For example, the first question confuses a “free annual consumer report” with the consumer report, a.k.a. background screen, used for employment purposes. Although both are a “consumer report” in legal terms, they have clear differences. A free annual report is a credit-only report provided by credit bureaus such as Experian, TransUnion and Equifax as required in the FCRA. Conversely, the employment background report that must be provided free of charge if requested by the subject of a report (which is called a consumer report as well), literally only exists if is was already requested by an end user (employer, landlord, etc). Will this be provided upon request? Absolutely. But, it’s not the same thing as the “free annual consumer report” described in the FCRA, which applies only to a credit report. Fortunately, with the increased attention and advocates such as NAPBS, it is likely that the sources of confusion will eventually be clarified, but only through open dialogue. Develop a relationship with us – our knowledge and experience will help you clarify any confusion you many encounter. The past few years have made, and broken records: multi million-dollar civil lawsuit settlements, multi million-dollar penalties from FCRA enforcement, a record number of EEOC discrimination claims related to background screening… and the first ever “professional plaintiff”. Starting with the first three, ongoing communication with Choice Screening and your attorney could help you (and probably could have helped some of these record-setters) avoid lawsuits, penalties and allegations. Why? Because there was a lot of repetition. Is the consent form compliant to FCRA, state and local laws? Is the Adverse Action process compliant to the FCRA, state and local laws? Are we correctly applying Individualized Assessment per the EEOC? Is our policy and practice compliant with the FCRA, state and local laws? Is the information we are requesting for given positions within the company in compliance with the FCRA, state and local laws? In reality, it takes work to keep up with shifting legislation while remaining efficient. An investment that apparently some employers do not recognize as a worthwhile! These patterns likely gave rise to the last: a professional plaintiff. Cory Groshek “earned” over $230,000 from more than 40 companies by exploiting potential FCRA compliance violations. Mr. Groshek found the loophole. He literally applied to hundreds of jobs, identified alleged violations and threatened class-action lawsuits. Paying attention to only a handful of lawsuits in the past few years could have clearly outlined what to target. Going forward, we expect to see increased diligence in prevention as more employers realize they have a choice regarding where to put their money: with a professional background screening company, with an attorney, with their employee’s salary to understand the intricacies of the background screening industry… or with defending a lawsuit or investigation. Have a relationship with Choice Screening. Have a relationship with an attorney experienced in employment and FCRA law. Invest in internal knowledge on background screening compliance. Budgeting for all three can help avoid paying for a defense. Here at Choice, we’re pretty lucky – we have awesome clients committed to making informed hiring decisions based on comprehensive, accurate background reports. 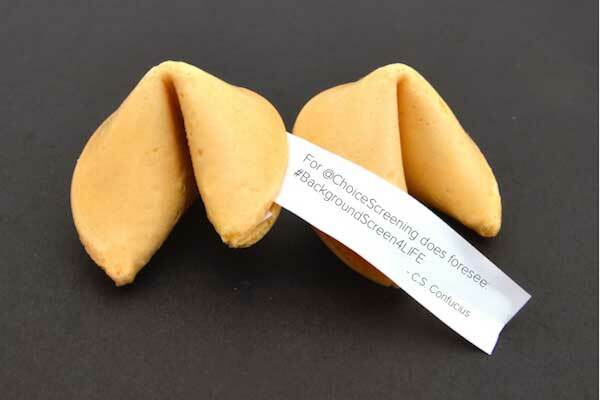 What do you see in the future of background screening?